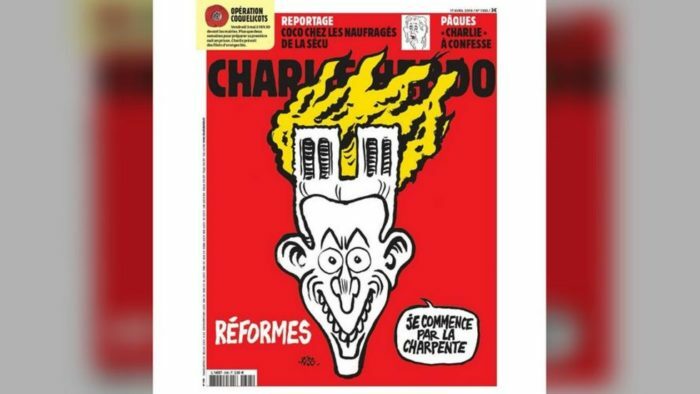 Controversial satirical magazine Charlie Hebdo was slammed after it ran a cartoon depicting the Notre Dame de Paris fire. Critics said it was surprisingly tame compared to the many times it joked about deadly disasters abroad. The latest cover shows a grinning French President Emmanuel Macron whose head is shaped like the facade of the iconic Gothic church engulfed in flames. The issue hit the shelves on Tuesday – one day after Notre Dame Cathedral was partially destroyed in a heavy fire, with its spire and roof collapsing. Poor taste? Not Funny? Whatever, no one is going to shoot them up for it.